What is a multimeter and why do we use it with plasma coils? 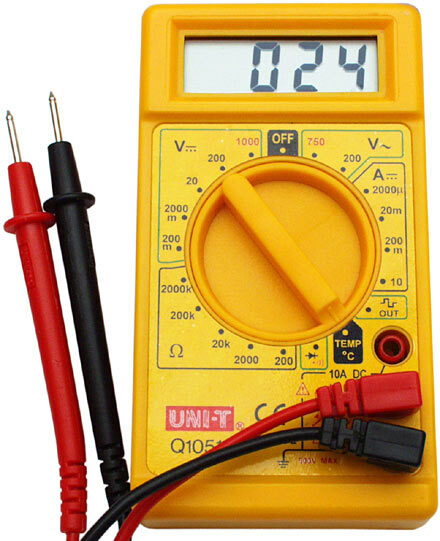 The Multimeter measures both AC and DC current. The old ones have a needle that moves and the new ones have a digital readout screen. The multimeter also has a setting that measures the resistance of the circuit/wire by sending a small DC current between the two probes many of the multimeters have an audible setting in the resistance setting. If you talk with very old electricians they will tell you that you hear resistance. meaning as the tone changed it reflected the amount of resistance in the circuit, because they did not have a digital read out of the difference between the current sent and the current received. When we heat up copper wire to nanocoat it, we build up a static charge inside the wire. This shows up as millivolts on our multimeter. Example: set your multimeter to read DC there is a red wire and a black wire on most meters that plug into the meter.. or the part that you plug in your probe wires is colored one red and one black.. some only have a (+), and (-) for DC The Red will be (+) and the Black will be (-) place the Red (-) to the (+) end of any small battery and the Black (-) to the (-) end of the battery. The meter will then read out how much voltage is available still in your battery meaning if you have a new 1.5 v AA battery your meter should read close to 1.5V. If it reads -1.5 volts you have reversed your wires from your meter. Either way it means your setting is correct to discharge the milivolts out of your nanocoated wires. Take a newly nanocoated wire (coil etc) and place one end of the probe to each end of your nanocoated wire. The new digital multimeters will automatically set themselves from usual DC current to the millivolt DC current. It does this by dropping the decimal point off the screen... meaning your multimeter may read 100 volts and start fluctuating down and back up until it reaches 0 you are reading millivolts and it takes 1000 of them to make 1 volt. The fluctuating down on the meter is reading the process of discharging of the nanowire. It can recharge on its own because the carbon nanocoating can grab the static electricity out of the air around it like an antenna. So if you wait a few minutes and test again you may see the same fluctuating down on your meter but not as high as before. CAUTION: never ever measure AC or DC voltage using the setting with the light bulb symbol! You will blow a fuse in your meter or ruin the meter forever! Never read voltage using the Ohm setting! Because of this 0-ing (zero-ing) feature of the Ohm meter function the old electricians contend you hear the amount of resistance. Back to our nanocoated wire. If you lightly touch each end of the nanocoated wire with the probes and the coating is really good you will get no reading meaning no voltage passed through the wire (0) Ohms. 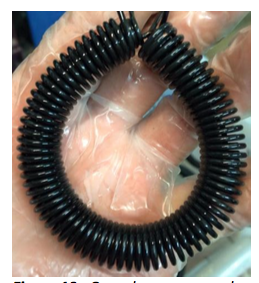 This is because the nano coating when done properly acts like wire insulation or plastic. This feature on nanocoated wire is only at the most superficial layers, if you scrape down and test you will find that there is less and less resistance and the number on your meter will increase. So you discharged your nanocoated wire and then tested the resistance but you find that your Ohm meter setting still has numbers showing up on the screen. Depending on what you are going to use your wires for and how soon this may not matter because when we run current trough nanocoated wires the nanocoating repairs itself ! Why do we have to discharge and test our nanowires? 1) it aligns the charge on the nanocoated surface to allow the Magrav/plasma Fields to pass quickly from point A to point B in a superconductive way (0) resistance. See also this article: click here. ​2) it sets the charge in spaces between the nano particles more evenly so the process of dipping the coils in dilute aqueous gans allows the mono-atomic particles of GANS to deposit into these spaces. If you leave a charge in the wire this charge may repel the mono-atomic gans particles.